A splendid example of a “prom date” song. (Or maybe I can just call it a “Johnny” song.) I can’t really say anything exceptionally insightful or witty about this song, because it explains itself. All you have to do is listen to the track and you’ll hear everything splendid about it: the song structure (a perfect example for that type of late-Fifties/early-Sixties song); the singing (Shelley Fabares’ voice is the sound of a pink chiffon dress); the musical accompaniment (ideal for this song – plus those pizzicato strings are sublime); and much, much more. Everything about it is a superb example of the craftsmanship (or hackwork, considering how quickly these songs were churned out by the people involved) that went into these “Johnny” songs. I love it to bits. I’ve heard about The Rubinoos but never actually gotten around to ever hearing anything by them. If this song is typical of The Rubinoos, I’m glad to have made their acquaintance. This song sounds to me like Paul McCartney circa-“I’ve Just Seen A Face” performed by the Raspberries (the Rubinoos’ vocal harmonies have “Raspberries” written all over them.) Although I really liked just about everything in “You Don’t Know Her”, I want to make a special point of mentioning the guitar solo – I think it’s fantastic. It’s incredibly inventive and well played. Now, I’m not wearing a hat at the moment – and I don’t know of anyone else who might be wearing a hat at the moment either – but I’m still going to say this: Hats off to the guitarist responsible for that guitar solo. I like this song a lot. And I’m now going to belatedly* get to know the music of The Rubinoos. The band was OK with that picture? They approved that? I must say that I was more than surprised when I saw on the back cover that Frank Zappa produced the album. My immediate reaction was to put an exclamation mark after Frank’s name. 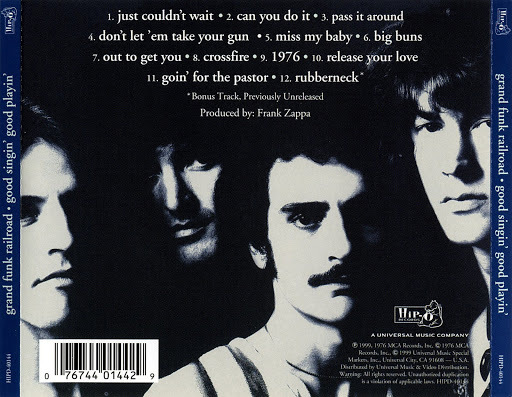 I think I will: a Grand Funk album was produced by Frank Zappa (!). 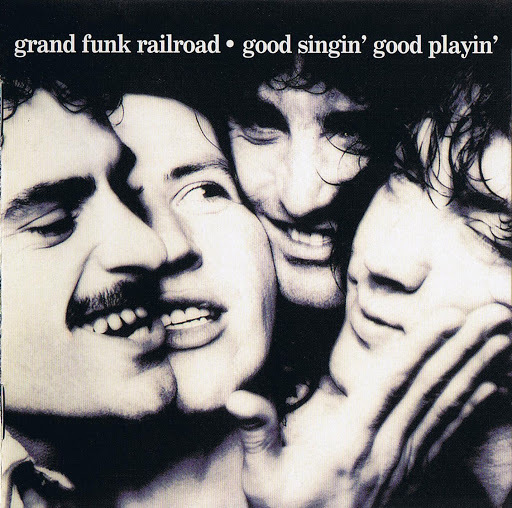 I don’t quite understand what led Frank “Why play a simple rock song when I can make it very complicated?” Zappa to become involved with a band as uncomplicated as Grand Funk Railroad. I haven’t heard the album, so I can’t tell how much Frank influenced the end result. For example, I don’t know if the band introduced extended musical passages (featuring unusual instrumentation) that aren’t related to the rest of the songs they’re in, or if they unexpectedly inserted smutty humour at various point in their songs. Frank Zappa. Grand Funk. I don’t get it. Nice. The first time I played it, I was quietly grooving to the track, thinking that it wasn’t one of the best pieces of Easy Listening I’ve ever come across (to me, the tunes weren’t especially memorable), but when the saxophones kicked in at 1:03 I thought “Oh yeah – that’s much better.” And with each subsequent listen, I’ve enjoyed “The Dis-Advantages Of You” more and more. Yummy. I’ve listened to it four times now. And I think I’ll listen to it again. You are currently browsing the archives for the Grand Funk category.